At Bellhaven Center, our staff is dedicated to working with patients and helping them acquire or relearn the skills they will need to be active and live independently. 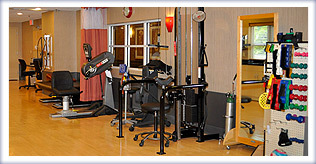 Our experienced staff of Physical Therapists work with each resident to improve strength and restore function through the use of therapeutic exercises. In addition, our Rehabilitation Program puts special emphasis on “pain management” so that each resident can maximize their potential in a comfortable and dignified manner. At Bellhaven Center we understand the importance of helping our residents get back on their feet and resume a self-sufficient way of life. Thus, our Occupational Therapy program is aimed at improving fine motor control, coordination, and cognitive skills and teaches functional and self-care skills commonly referred to as Activities of Daily Living (ADL), which include feeding, dressing and grooming. Our trained Speech and Language Pathologists help our residents communicate more effectively by using advanced techniques in oral and pharyngeal sensorimotor training.